Frank Odonkor is one of the handfuls of homeless to be evicted Thursday. Things look bleak for those trying to help. WOODBRIDGE — On a cool, damp, muddy morning in the homeless camp behind a shopping center, his is the only campsite where blue smoke billows. Pots and pans, all charred with at least an inch of black hardened soot after years of being used over an open flame sit on a grill inside a hollowed out tree trunk used as a hearth. “I’m trying to make some coffee,” said Frank Odonkor. He sits on a five-gallon bucket and tends to his fire. A piece of hardtack atop the bucket next to him rounds out his breakfast. His campsite behind the Potomac Festival Shopping Center is fortified by more than 40 more five-gallon buckets that he uses to grow vegetables. Shopping carts guard the entrance to his campsite. When he was young, Odonkor worked planting trees in Ghana’s ministry of agriculture. Now 50, he came to the U.S. in 2006 from Ghana in hopes to start a new life. It didn’t work out as planned, and he started living in the woods two years later. He wants to return to his home country, but he says he cannot get a passport for the return trip. Odonkor has two tents at his campsite and rarely talks to his neighbors. The woods are a lonely place. “It depends on who you talk to here. Some people you can talk to, but if you make them angry, they will come back and make your life harder,” he said. He also expressed little interest in living in a shelter. Too many people in too close quarters, he says, and too many chances to make someone angry. 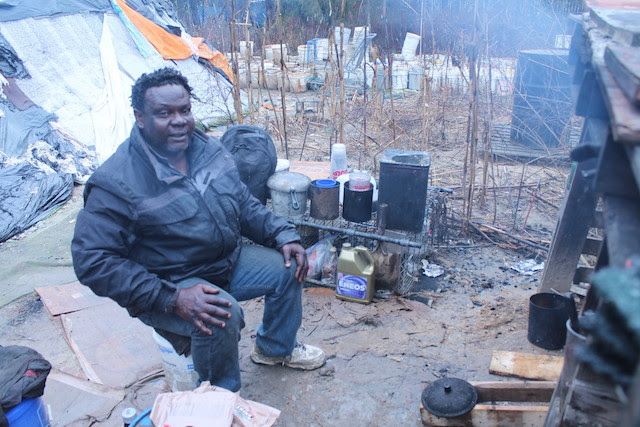 If not a shelter, then Odonkor has few other options come March 1 when he and about 30 others who live in what’s been dubbed “Woodbridge Tent City” will be removed from the property by order of the owner, Parsons Potomac Mills Limited Partnership. Earlier this month, a spokesman for the partnership told us that for years the owner has allowed homeless to stay there but that they now plan to develop the property for commercial use. Over the years, trash from the homeless camps — everything from tarps to boom box speakers — has piled up on the property resulting in fines and clean up orders imposed by Prince William County, he said. The property is also one of three sites being considered as a site for a new $37 million commuter parking garage Prince William County will build with federal dollars. The other two sites — one is an “at home” store on Dale Boulevard (a former Kmart store), and the other is at Stonebridge at Potomac Town Center, near a site where a new minor league baseball stadium was to be built before the deal fell apart last year. Whether or not the parking garage goes on the Parsons property, the homeless have to go. And that has church volunteers like Rich Garon who try to help those in Tent City feeling somber about the outlook for guys like Odonkor. “We’re not very hopeful at this point. While some people have left, there are many others not sure where they’ll go. People I’ve spoken to have made sincere efforts to find rooms or apartments, but little success so far. We’ve got four days to go. Maybe others working on this issue can point to more success, but this is what I know,” Garon stated in an email to me. Some of the campsites in Tent City are elaborate with fences, walkways, awnings, and gasoline-powered generators. You can hear TVs and radios playing as you walk down the muddy path and trek deeper into the woods. Garon says the clock has wound down for the for the homeless at Tent City, and that they’ll probably end up moving to another nearby property. It’s the same thing that happened before when Virginia State Police was ordered in 2011 by then State Delegate Scott Lingamfelter to remove homeless from camps on nearby state-owned property at the intersection of Interstate 95 and Dale Boulevard. We were there as police met little resistance as they cleared the camps. Many left behind what they couldn’t carry in shopping carts, to include mattresses, tables, and chairs. The undeveloped woods around Potomac Mills mall are a haven for the homeless for the same reason everyone else likes to shop here: it’s convenient to access to shops. Odonkor walks to Best Buy to purchase more minutes for a cell phone someone gave him. He’ll walk across the street to Walmart to pick up small items when he’s lucky enough to have cash, before returning to his campsite. His favorite food is pupusas — El Salvadorian grilled tortillas. He keeps other foods donated to him, the stuff he doesn’t much care for, locked away in some of his five-gallon buckets, saving it for a rainy day. When the March 1 deadline comes and goes, Garron and his volunteers at Immanuel Anglican Church will continue to work with the homeless on an ad hoc basis. Over the years the church as donated tents, access to medical care, propane, and food. Garon says he’s also trying to work closely with the county to fund solutions for the homeless. “I’ve attended a number of meetings and met with a number of groups and officials. While these groups and representatives are generally well-meaning and kind-hearted, from my trial-and-error experience over the years in filling out forms and trying to find out about appropriate programs, I’d have to say we need some better programs and word getting out in a more effective manner about how to access them,” states Garon in an email. “There is no short-term fix or one-size-fits-all solution,” he adds.